This coming weekend, June 23-24, will once again see the MoCCA ArtFest in the Puck Building in SoHo, New York. Always an event well worth attending, there will be extra reason to do so this year for people interested in Scandinavian comics. The Danish, Norwegian, Swedish and Finnish consulates have collaborated on a joint manifestation at the festival. The Danish part is organized by New York-based Danish cartoonist Henrik Rehr, who has invited a group of distinguished Danish cartoonists and publishers, all of whom will be at hand to draw, and talk about their work. Look for similar manifestations from the other participating countries – the Scandinavian contigent can be found at booths S13-17. 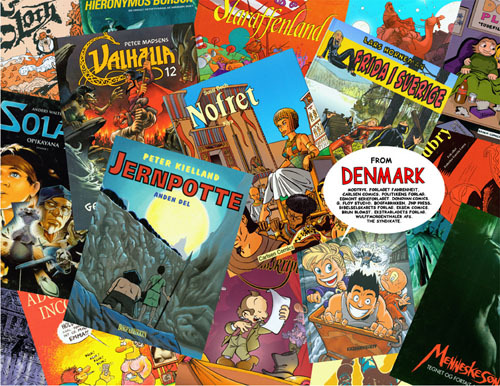 The following Danish cartoonists will be present: Mikael Wulff, Peter Snejbjerg Nielsen, Allan Haverholm, Morten Ingemann, Rasmus Julius, Martin Flink Nilesen and Henrik Rehr, as well as publishers Christine Jensen and Michael Møller-Andersen of GFloy Studio, Michael G. Nielsen from Egmont Serieforlaget, as well as Tobias Hoff and Sarita Christensen of Wulffmorgenthaler Aps. Books from the following publishers will be available for perusal: Carlsen, Egmont Serieforlaget, Forlaget Fahrenheit, Bogfabrikken, G. Floy Studio, Politikens Forlag, Ekstrabladets Forlag, Donovan Comics, Brun Blomst, Modtryk, Det Danske Bibelselskabs Forlag, JNP Press, The Syndikate, Eksem Comics og Wulffmorgenthaler. As a special, shameful self-plug, I here want to note that Rackham’s own, big Danish anthology BLÆK will naturally be there. Looks like it’s going to be a great festival – the program certainly is attractive. Wish I was going. Check out The Comics Journal‘s extensive preview of the festival here, and oh, BTW read my report from the 2004 MoCCA Arts Festival here (in Danish), and check out my pictures from it.